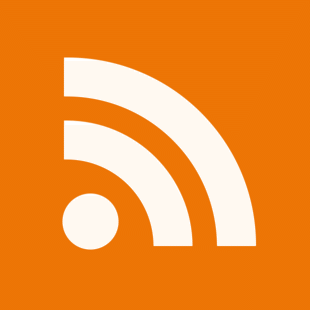 Ross Cooney of Rozmic contacted me recently to tell me of their latest product, EmailCloud. EmailCloud is a server-side anti-(email)spam application which is accessible and configurable through a browser. The setup wasn’t as straightforward as I had hoped (I messed it up!) but a quick email to Rozmic and I had the solution back in minutes! 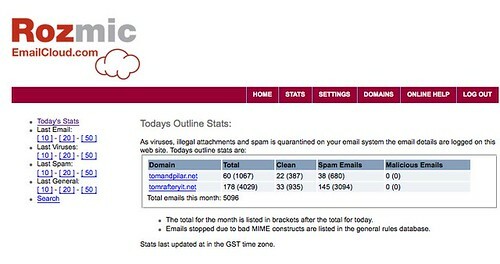 As you can see from the stats below, up to 75% of the emails I get are spam! However, because EmailCloud is server side, my email client never sees those emails saving me bandwidth and hassle. The great thing about EmailCloud is that, being a hosted app, you can simply set it and forget it. Hey anything that fights email spam is a good thing in my book, I think at 75% you are below average as the latest figure I heard was closer to 90%. We block around 90% of all email across our network…but that does not mean that 90% of email is spam…just that 90% of our clients email is spam. Looks interesting – when more information on features is available for the website I’ll take another look. I use ASSP (sourceforge project) at the moment which is effective for stopping spam but the management side isn’t great e.g. handling miscategorised mail. Right now I use Gmail and I’d say it does an acceptable job of keeping spam out of my inbox. Istead of 90 percent spam, I get more like 15 percent. Not too bad really. Out of interest to Tom or Ross, based on what you have scanned for tom what would that set the ordinary punter back? This will show you through the basic setup and management of an account. Most of our business is done through ISP’s and hosting companies. While the technology is not new to us, selling to “end users” is and we generally do this through resellers. We dont have any registered resellers in Ireland yet. I travel to Ireland almost every week and we have started talks with a few resellers in Dublin and Cork. If you know of anybody who is interested in becoming a reseller please pass me their details. Over this we can provide price upon application. Most people over this price pay either a bulk rate or on a â€œper emailâ€ basis. Thanks for that video (I finally sat down to watch it), looks good and it’s nice to see that you’ve covered the angles like being able to search through spam and release if required.